Erwin’s history stretches back to colonial times through its connections to the nearby colonial settlement of Averasboro. Here, Timber Rafters along the Cape Fear River would stop for the night and resupply. 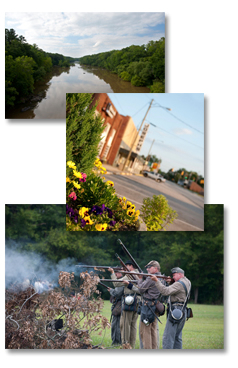 Although long abandoned, historical accounts of Averasboro during the Revolutionary War and as the site of one of the last battles of the Civil War bring a rich history to Erwin that can still be explored today. Originally, the town of Erwin was known as Duke, named after the Duke family members who were prominent stakeholders in the newly constructed Erwin Cotton Mill, completed in 1904. Later, in 1926, when Trinity College in Durham, NC, became Duke University, the town’s name was changed from Duke to Erwin. The mill was the engine that powered Erwin until its closing in 2000. Even today, Erwin is still referred to as the “Denim Capital of the World” for the vast quantities of raw denim the mill produced for well over half a century. Today, Erwin is a thriving town with new business opportunities and a valued quality of life. If you are looking to relocate your family or business, we hope that you will consider Erwin your new home. Or, if you are just passing through, take a few moments and explore the many things Erwin has to offer. One thing is for sure: here you’ll find warm and friendly people who will make you feel welcome. Erwin is within easy driving distances of both the beaches of North Carolina and South Carolina and the Blue Ridge Mountains of western North Carolina. Erwin is just four miles west of Interstate 95 and bisected by three major routes: 55, 421 and 217. The Cape Fear River, located at the edge of Erwin, offers recreational activities for hiking, fishing and mild white-water kayaking and canoeing. Nearby Raven Rock State Park presents miles of hiking trails with scenic overlooks and a nature center. Erwin has two municipal recreation parks offering family activities and league baseball, football and basketball. Golf is available at the 18-hole Chicora Country Club. The Dunn-Erwin Trail is a seven-mile walking and biking trail that follows the old Erwin Mill railroad spur. There are 11 major colleges and universities within 90 minutes’ driving distance from Erwin. Campbell University is just seven miles west of Erwin and offers graduate programs in business, education, guidance and counseling; a pharmacy school and a new school of osteopathic medicine.